After a riveting competition among the final 10 competitors who showed off their best dancing, singing and acrobatic moves, a 36-year-old from Morocco was crowned the winner of the fourth season of reality show Arabs Got Talent on Saturday night. Salah Benlemqawanssa, better known by his stage name Salah Entertainer, stood motionless for a few seconds after his name was announced as the winner of the show, which aired on MBC4 and MBC Masr across the Middle East. 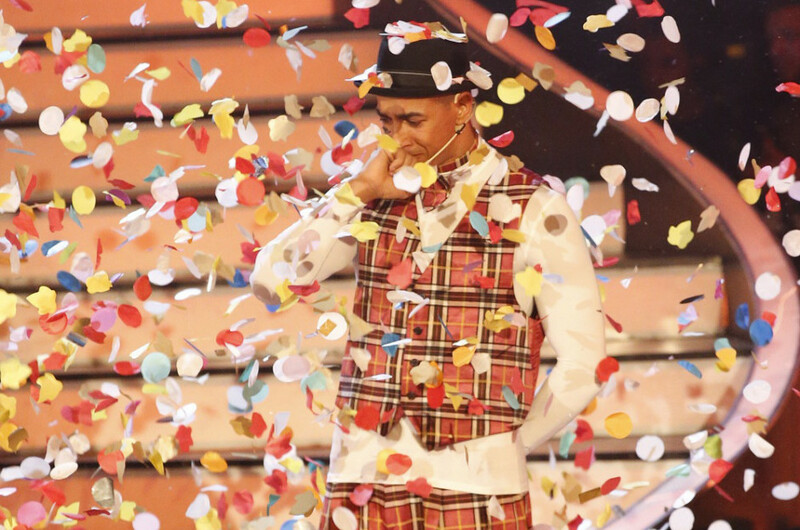 He then began to cry and covered his eyes with his fingers as confetti fell from the ceiling at the MBC studios in Beirut. The victory was “so important for him as it brought him back to his Arabic roots,” Mazen Hayek, an MBC spokesperson, told tabloid! after the show. Hayek was quoting the words of Benlemqawanssa, who also has French citizenship. Benlemqawanssa, who won France’s Got Talent in 2006, calls himself a dancer. When he dances on stage, he moves his body as if he is twisting clay. He calls his personal dance style P.A.B.E., which stands for Popping, Animation, Boogaloo and Effects. With his win, Benlemqawanssa received a cash prize of 500,000 Saudi Riyals (Dh489,000), a Chrysler 300C car and a trip to London to attend Britain’s Got talent, where he will meet with star-maker Simon Cowell. When he won the French version of the competition, he was described as the new Charlie Chaplin. Born to a Moroccan father and an Algerian mother, Benlemqawanssa suffered from poverty and deprivation. He made sacrifices to help his family; his parents and two sisters. But he proudly spoke of his ability to manage the suffering and pain into a force to excel rather than a force of anger, Hayek noted. Benlemqawanssa was one of the several highly talented participants from northern African countries in this season of Arabs Got Talent. MBC says the fourth season of Arabs Got Talent has been the most watched. “The fourth season has important participants in terms of their performances and professionalism, as well as audience viewership and people’s interaction with the show on social media,” said Hayek. After winning the title, Benlemqawanssa told the media he would like to send a message to the world: “We Arabs and Muslims are not violent and dangerous. We know how to dance and cheer,” he said, adding he now has dreams of making a Hollywood movie about his life.